Everyone remembers being afraid of dark spaces as a child. Even the shadowy space under your bed was a potential monster hideaway. The bigger your imagination, the worse the monsters you imagined. A friend of mine posted her 7-year-old son Chester's school project on Facebook. To celebrate their one hunderth day of school, his teacher asked each student to bring in a hundred of something. He decided to bring a list of one hundred monsters. At first, as with all scary things, it seemed like there were an infinite number of monsters. So many monsters, in fact, that he decided to group them into tens. Ten dragons, ten cryptoids, ten movie monsters… Also, it wasn't enough to just have the name, he had to look up each one and learn about it. 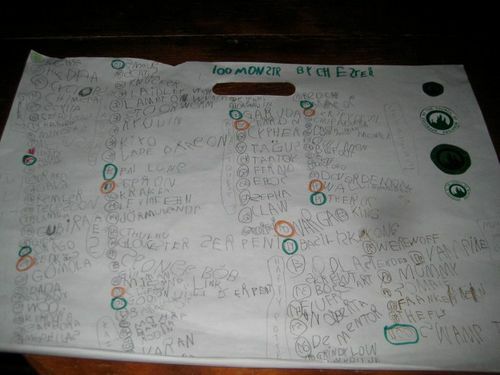 He then painstakingly wrote each one, learning how to spell even the Kaiju monsters. With each step the list got more and more manageable until, toward the end, it was hard to even come up with enough monsters to finish. It struck me how helpful it would be when you are faced with completing an impossible, scary project to list your monsters. Sometimes just a blank piece of paper is the terrifying dark closet that contains everything that scares you into inaction. Instead of letting yourself get overwhelmed by fear and inertia, why not list out all the things that are stopping you from starting? Get a piece of paper and write them out. Break them into sections if you want, anything to make them more manageable. In fact, try and list a hundred things preventing you from moving forward. It's not easy to do. I bet it's hard for you to get past twenty. You can start with the teacher in the fifth grade who told you that you'd never amount to anything and then move on to that nasty commenter on your blog that tells you that it's hard to read your writing because there are so many grammatical mistakes and run on sentences. Once you see the monsters all laid out neatly on a piece of paper, I bet they're no scarier than Spongebob Squarepants. Who, if you look carefully at the picture above, you'll see in the Sea Monster category between the Gloucester Serpant and Gill-Man. Great idea. Thanks. It also helps to write a personal pep talk for yourself every morning that addresses your biggest “monsters.” Telling yourself, “I’m not too old to try something new and my experience is an asset to my idea.” Positive statements are always good to say out loud to counteract the negative thoughts in our mind that plague our progress. What a great idea to list your monsters. And in the end, often those supposed monsters feed into a creative process. They’re sort of necessary, in their own abundant way.